Gran Turismo HD Concept is a PlayStation 3 driving simulator game developed by Polyphony Digital that was made available for free download on December 24, 2006. It was intended to be a sneak preview for the then-upcoming game Gran Turismo HD, which was cancelled in favor of Gran Turismo 5 and its Prologue. It was also released as a Blu-ray disc in Japan in limited numbers sometime around September 2007. Online servers were shut down and the game was removed from the PlayStation Store on September 30, 2007, rendering it impossible to download legally ever since. Since Gran Turismo HD Concept was meant to be a sneak preview and not a full game, Gran Turismo HD Concept only features 10 cars, ranging from the 1995 Suzuki Cappuccino kei car to the 2006 Ferrari 599 sports car. These cars are available in both stock and tuned version, once unlocked. It also includes only a single track, Eiger Nordwand, which is set in the Swiss Alps. A reverse configuration of that track is also available once unlocked. Two play modes are available: Time Trial and Drift Trial. Both modes feature an Internet ranking chart for each continent. Gran Turismo HD Concept is the first game in the franchise to support online ranking. The Replay mode is also available, with each course's best five records per car in both Time and Drift Trial can be downloaded by users under the form of a replay file. This game could have been determined not so much as "lost" as it was "inaccessible," because many users had it downloaded on their hard-drives, but it wasn't available to those who didn't have it and wanted it. As such, this game fell into a special in-between group of lost media, since it wasn't quite lost. On October 10, 2018, LMW contributor Dashey10 provided a dump of the Japan-only Blu-ray disc of Gran Turismo HD Concept, marking the first time the game has been widely available since being delisted from the PlayStation™ Store. 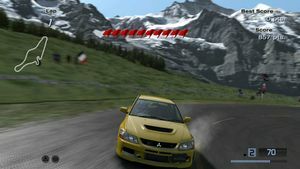 Gameplay of Gran Turismo HD Concept. [BCJX-96001] Gran Turismo HD Concept [Japan] (PS3) - MEGA link. Wikipedia page on Gran Turismo HD Concept. IGN page on Gran Turismo HD Concept.